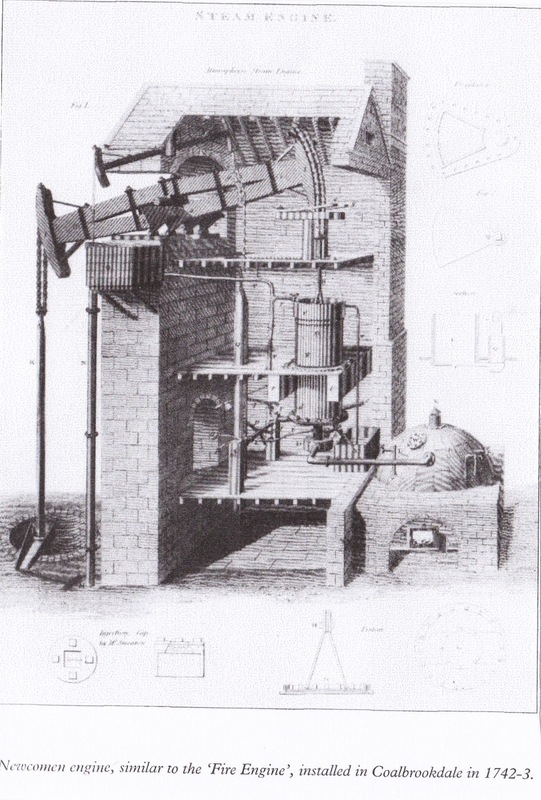 The blast furnace had been invented in the 15th century, but mass production of iron was held back by two factors. Enormous quantities of timber had to be felled to provide the charcoal for fuel, and strongly flowing water was required to power the bellows for the blast. These problems were to be solved in Shropshire in the 18th century. 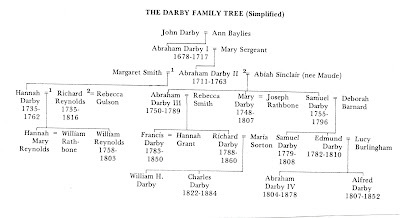 Abraham Darby was born in 1678, in a Quaker family near Dudley. The Quakers (otherwise known as the Society of Friends) were a close community, often intermarried. Until the Toleration Act of 1689 they had been fiercely persecuted. That now ended, but they were still very much “second-class citizens”; forbidden to enter Parliament or the ancient universities. They had originally been radical extremists, founded by the charismatic preacher George Fox, but within a couple of generations many had become respectable businessmen. Because they were often related to each other, were noted for their financial integrity and famously spent nothing on luxuries or outward display, they accumulated money, lent it to each other on generous terms and went into partnership together; all very important in the days before proper banks or limited companies. The Quaker community came to include the bankers Barclay, Lloyd and Gurney, and the chocolate manufacturers Cadbury, Rowntree and Fry. 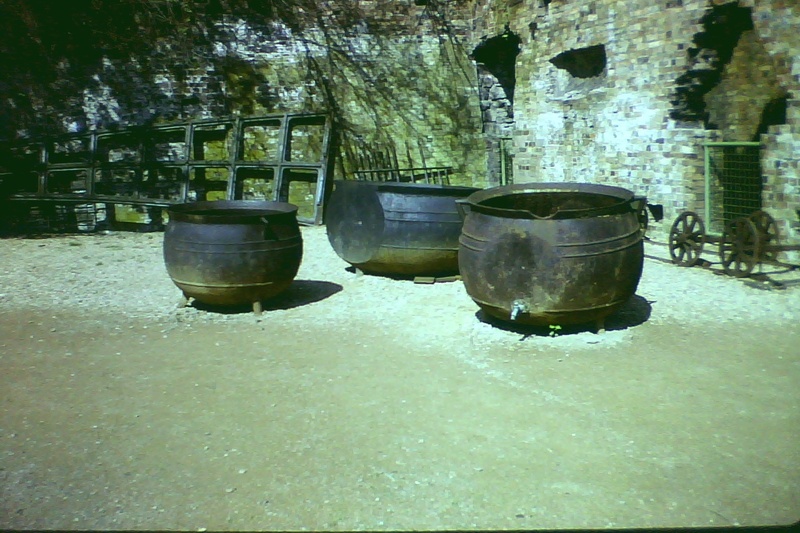 Abraham Darby 1 (as he is always called, to distinguish him from his descendants of the same name) was apprenticed in Birmingham before moving to Bristol, where in 1702 he and three partners set up the Bristol Brass Company, using coal in his furnaces. In 1706 he set up an iron foundry, and in 1707 was given a patent for casting bellied pots in sand. 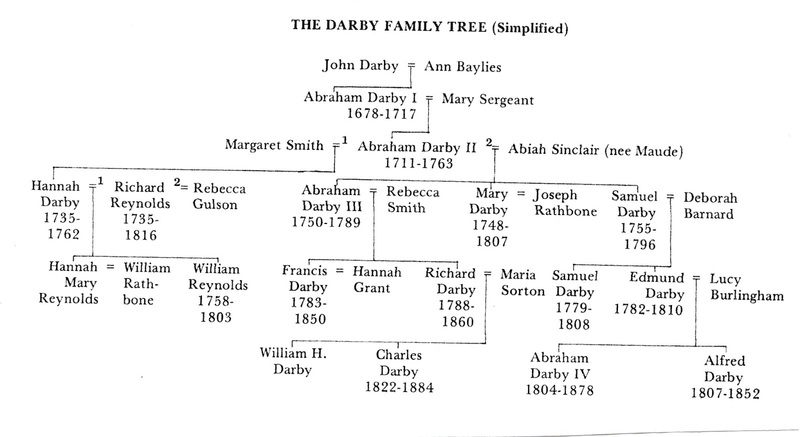 Abraham Darby I is of course remembered for one famous development. 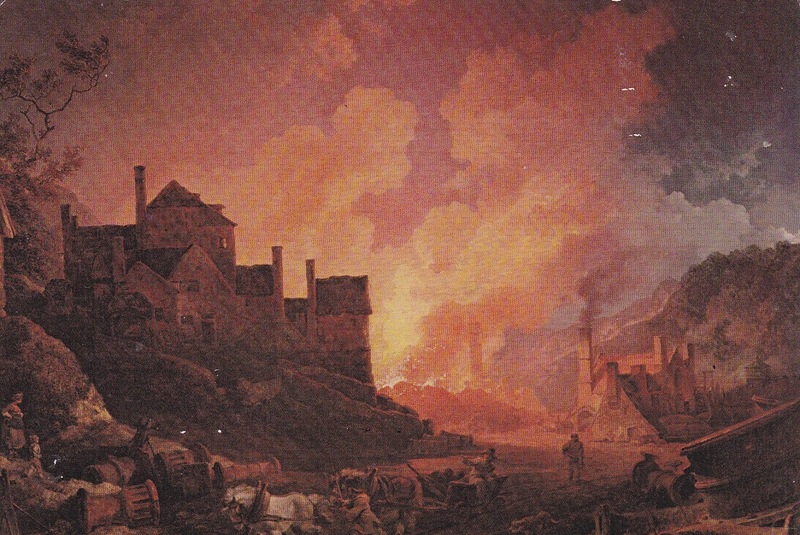 In 1708 he leased a derelict blast furnace in Coalbrookdale in Shropshire, and began to operate it using coke. It seems that he learnt how to make coke (by burning coal slowly, under heaps of ashes; similarly to the making of charcoal from wood) back in Bristol, where it was used in the brewing industry. He was fortunate that the local Shropshire clod coal was low in sulphur and other harmful elements. and this is a view of the inside. Both pictures show the "tap hole" where the liquid iron would run out. They were taken many years ago: sadly, you can't get that close nowadays! This area of the Severn valley, between Shrewsbury and Bridgnorth, was rich in coal, ironstone and limestone, with lead from the Stiperstones. 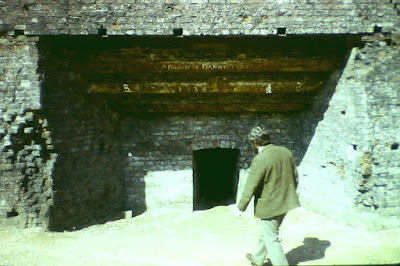 The clay around Brosely was found to be particularly suitable for making clay pipes! 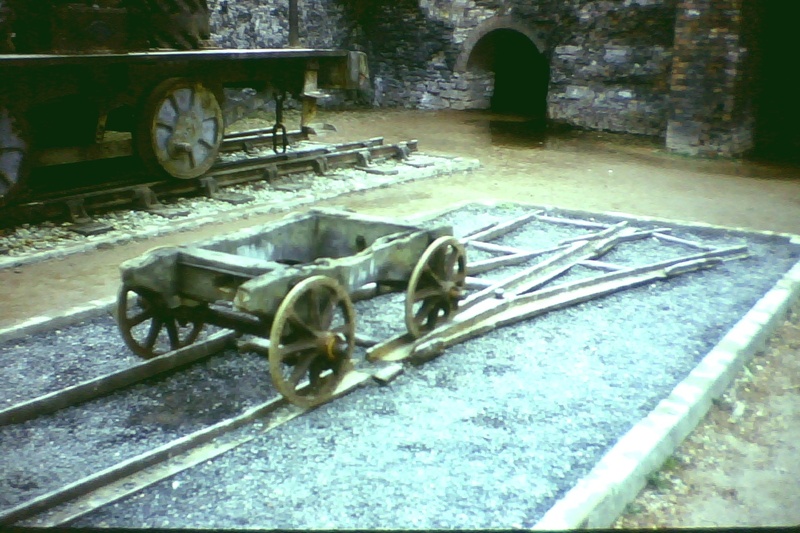 As early as the mid-13th century the monasteries at Wenlock and Buildwas had leased out the right to mine coal, and their example was followed after the Dissolution of the monasteries by local landowners. There was also the great advantage of the river Severn, linking down to Bristol. The roads were in such a poor state that water was the only way of moving heavy bulk goods over a distance. (Though boats coming upriver often had to be hauled by gangs of boatmen on the banks!) 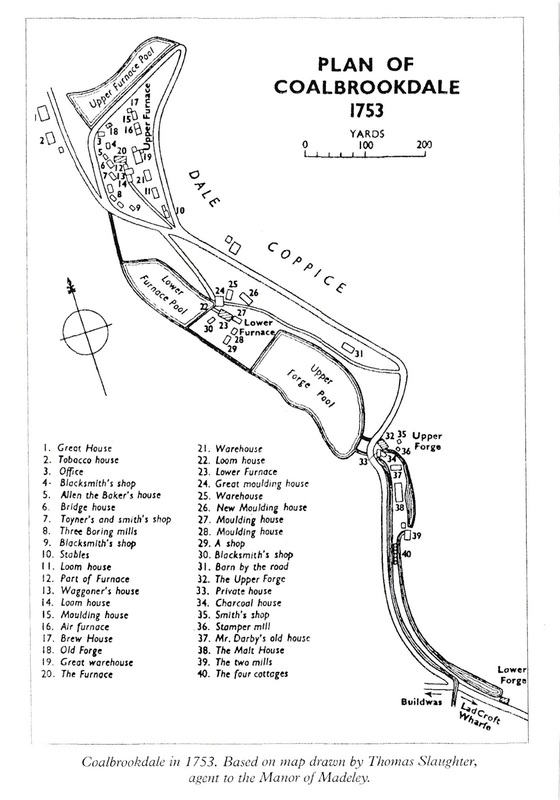 By the late 17th century there was ironworking at Coalbrookdale, Willey, Madeley, Lightmore and Leighton, with other industrial centres at Broseley (where there was a railway as early as 1605! ), Benthall, Jackfield and other places. This stretch of the Severn flows through a range a range of hills, and Coalbrookdale itself has a fast-flowing stream, a tributary of the Severn, suitable for powering a water-wheel. Abraham Darby I died in 1717, aged just 39. His eldest son, Abraham Darby II, was only 6 years old, so Coalbrookdale was run by a relative, Richard Ford, for the next few years. Abraham Darby II became a salaried assistant to Ford in 1732 and took over when Ford died in 1745. Here we should note that the works were actually a company owned by 4 shareholders. They were valued at £4,200 at A. Darby I’s death (at a time when the vast majority of families were earning less than £40 a year!) and it was all done on borrowed money – mostly borrowed from fellow-Quakers, but even so, there were often fierce financial disputes! This type of track is technically known as a "plateway"
In 1742 Darby installed a Newcomen steam engine to pump water upstream to the furnace pools, thus solving the problem of insufficient water in dry summers. He cast parts for Newcomen engines, including accurately-bored cylinders. He sought to have complete control of all iron-working processes. His Quaker pacifist principles did not prevent him from casting cannon when war broke out in 1739! He was a rich man when he died, aged 51, in 1763.
who in 1757 took over a furnace at Broseley and built others at Willey, on the other side of the Severn. 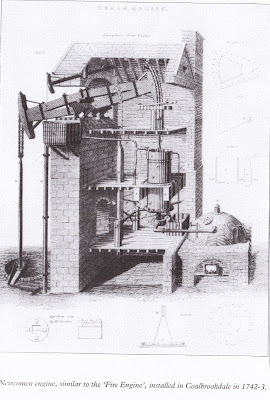 He was more innovative than the Darbys, installing the new improved rotative steam engine patented by James Watt (1781) to supply the blast, rather than having to rely on water power. 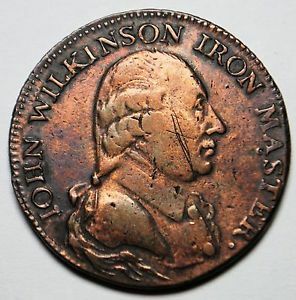 Wilkinson patented a new machine for boring cylinders, and amongst other things he built the first iron boat, launched on the Severn in 1787, an iron pulpit for a new church at Bilston and an iron coffin for himself – which he couldn’t be buried in because he was too fat! In contrast with the innocuous Darbys, he was a controversial figure: a radical who sympathized with the French Revolution. He was said to be malevolent and unscrupulous in his business dealings and immoral in his personal life; but became something of a folk-hero in the district, with songs sung about him by his workforce. There was another interregnum after the death of Abraham Darby II, during which time the works were run by Richard Reynolds, who had married ADII’s daughter Hannah. Their son, William Reynolds, was perhaps the most innovative ironmaster of all, and things would have been quite different but for his early death, aged just 45, in 1803. Abraham Darby III (1750-1789) is always remembered for the building of the Iron Bridge over the Severn near Coalbrookdale. 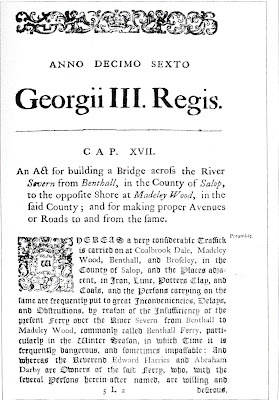 A bridge had long been contemplated, because none existed between Buildwas and Bridgnorth, so in 1775, various interested parties met, and a Shrewsbury architect, Thomas Pritchard, was commissioned to design it. It has been disputed whether Pritchard contemplated an iron bridge or a traditional stone one, but when he died in 1777 it was decided to build a bridge of cast iron: the first of its kind in the world. A private Act of Parliament had to be passed to permit the project to go ahead. It was a massive project, since the Severn at this point flowed swiftly through a deep gorge, and the bridge had to be high enough to allow ships to pass underneath with their masts raised. The estimated cost was £3200, but it is not surprising that the eventual cost was almost double that! The bridge was erected in summer 1779, with 30 men employed, plus temporary local labourers. The bridge itself was completed in late October, with 9 guineas being spent on ale to celebrate! 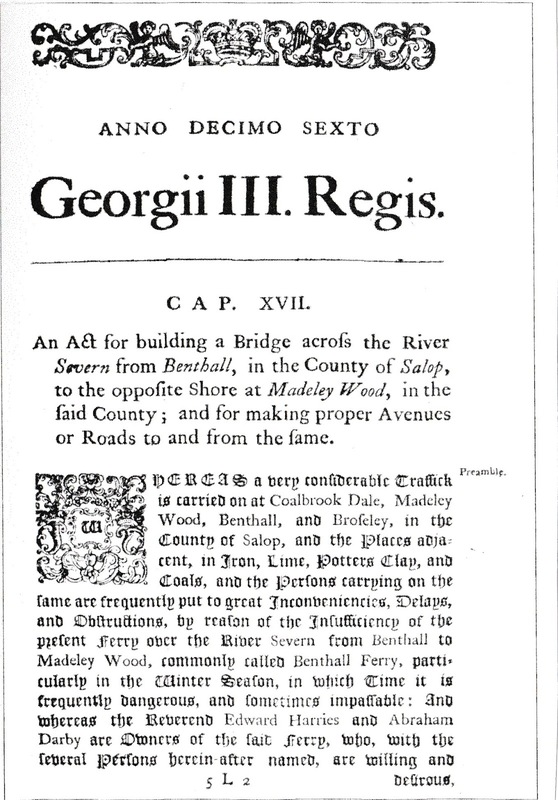 But much work was needed on the approaches before it could be opened to traffic on January 1st 1781. It was an immediate sensation, and is still a major tourist attraction. In fact, it followed closely the design for a wooden bridge, but using cast iron. 400 tons of iron were used in castings for the bridge; constituting perhaps 3 or 4 months’ total output of the Coalbrookdale furnaces. Nobody was certain exactly how the bridge was erected. A few years ago, using a contemporary artist's painting as a guide, a party of Royal Engineers succeeded in erecting a half-scale model of the bridge, though with some difficulty! 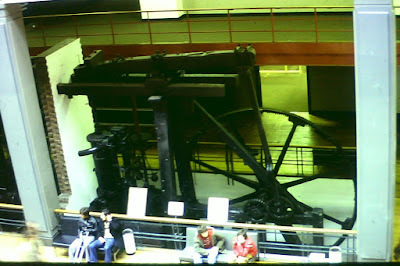 In 1781 a huge new Watt engine installed at Coalbrookdale, replacing the old Newcomen one. But Abraham Darby now seriously overstretched, with debts of £60,000. He sold out to Richard and William Reynolds, father and son, who developed the Blists Hill site, and died of scarlet fever in 1789, aged 39. Much of the Coalbrookdale complex was sold off. But the great days of the site were now over, especially after the premature death of William Reynolds in 1803, aged 45. The iron industry was now freed from its dependence on water power and charcoal from the forests; but Shropshire was unable to take advantage of this. 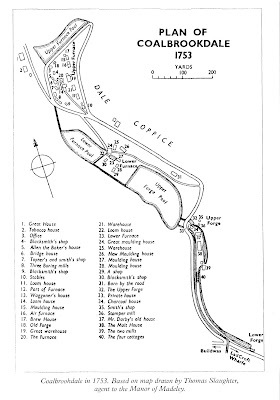 It was too remote from other centres of industry, which became apparent when the development of canals and then of railways reduced the importance of the Severn as a means of transport. The iron industry moved to the coalfields: to the Black Country, south Yorkshire, south Wales and Clydeside. 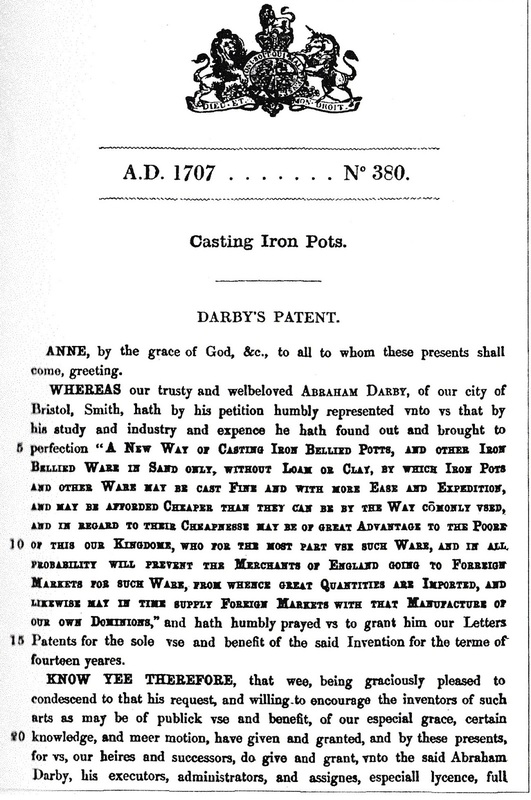 In 1818 iron smelting ended at Coalbrookdale, though new prosperity came in the 19th century with castings from other firms’ pig iron, including 800 tons of iron plates for SS “Great Britain”. 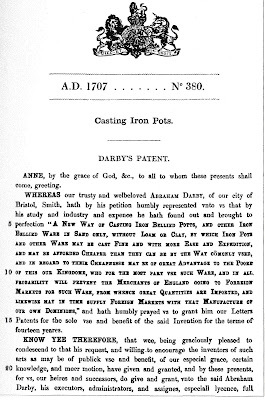 Art castings from the site were much admired at 1851 Great Exhibition. But Shropshire was fast becoming an economic backwater, and was to remain so. Coalbrookdale and Blists Hill were no more than industrial museums. In the first half of the 19th century, cast iron still had relatively few uses. Most pig iron was converted into wrought iron by burning off the carbon content: a cumbersome process. In 1784 Henry Cort invented a Puddling Furnace to do this using coke. Cort's furnace was like a blast furnace lying on its side. The system was improved by Joseph Hall of Tipton, who added bits of slag, scrap-iron and furnace tinder. He found the mixture boiled violently, but produced good quality iron with little wastage. Cort also invented a rolling mill, which could produce accurate sheets of wrought iron. The mid-19th century was the golden age of wrought iron. The problem yet to be solved was how to produce steel on a large scale. Various techniques had been discovered in the 18th century, including Blister Steel or Crucible Steel (where bars of wrought iron + charcoal were packed in closed clay vessels called coffins & placed in furnace for several days: found to be covered in blisters. 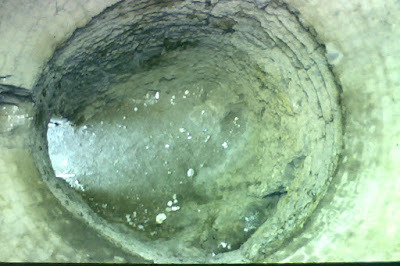 In Sheffield, Benjamin Huntsman broke up the result into small pieces and melted in crucible. Slag formed on surface; skimmed off to leave good quality steel. But it was only after the invention of Henry Bessemer's Converter and G.W. Siemens's Open-Hearth furnace in the latter part of the 19th century that the steel age really began. Economic historians used to say that there were really just four great developments in human history. The first was the discovery of the use of fire, which above all distinguishes humans from all other animals. The second was farming, which began in Iraq and other places after the end of the last Ice Age. The third was the use of metals, especially iron, which I mentioned in my previous blog entry. And the fourth was the Industrial Revolution, which began in the 18th century with the mass production of iron, and which by 1900 had transformed the entire world. Because the Industrial Revolution began in Britain, it promoted Britain into a great world power, and because of the Industrial Revolution, the Europeans took over the world, as indeed Karl Marx in 1848 had prophesied they would. And the Industrial Revolution began right here in Shropshire, with the work of the Darbys, Wilkinson and their fellow-workers. For more information on this, I can recommend Barrie Trinder's books: "The Darbys of Coalbrookdale" and "The Industrial Revolution in Shropshire"; and also "Coalbrookdale and the Darbys" by Thomas, and "The British Iron and Steel Industry" by W. Gale.